July 1862 on the James River, note the battle damage on the turret. USS Monitor was the first ironclad ship to be commissioned into the U.S. Navy. Built during the Civil War in response to the Confederate Navy's ironclad CSS Virginia, Monitor played an integral role in the transformation of military vessels from wood to iron. On August 3, 1861, Union Secretary of the Navy Gideon Welles published an announcement calling on designers to submit plans for ironclad warships to the Navy Department. With the support of Cornelius Bushnell, who controlled several railroads in Connecticut and had entered the world of naval architecture, renowned engineer John Ericsson submitted his plans for an "impregnable iron battery" to the Navy's Ironclad Board. Ericsson's design was chosen along with two others. He was awarded a contract in the amount of $275,000 to build his planned ironclad and charged with doing so in one hundred days. 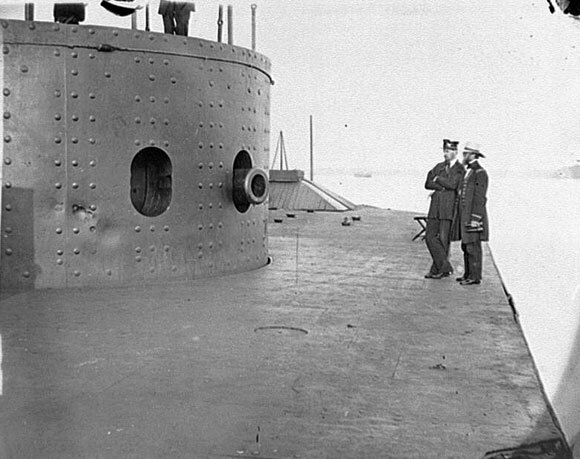 USS Monitor was launched on January 30, 1862. Under the command of Lieutenant John L. Worden, Monitor was ordered to Hampton Roads, Virginia, where she fought the Confederate ironclad CSS Virginia in the first battle between ironclad ships. The two ships engaged each other for nearly four hours with neither inflicting serious damage on the other. The battle ended in a draw, although both sides claimed victory. On December 31, 1862, while in tow by USS Rhode Island to Beaufort, North Carolina, Monitor sank during a severe storm off the coast of Cape Hatteras. Four officers and twelve crewmen lost their lives. In August 1973, Duke University, the Massachusetts Institute of Technology, the National Geographic Society, the University of Delaware, and the North Carolina Department of Cultural Resources participated in an expedition using Duke University's research vessel Eastward. On March 8, 1974, after extensive examination of video and photographic images, a formal announcement was made that the Duke University team had located the wreck of USS Monitor. On September 26, 1974, the governor of North Carolina nominated the Monitor wreck as the nation's first marine sanctuary. Currently, the Monitor National Marine Sanctuary is part of the National Oceanic and Atmospheric Administration (NOAA) Marine Sanctuary Program. 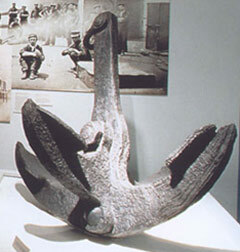 Mariners' Museum was designated as the repository for USS Monitor artifacts. The Museum has curatorial responsibility for the Monitor collection, a federal collection that includes historical information on the ship as well as all on the scientific data and artifacts resulting from the numerous expeditions to the site. 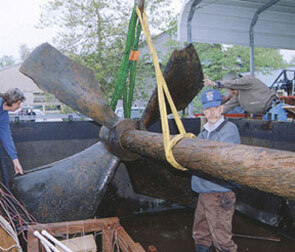 The Museum also provides conservation for all material recovered from the Monitor National Marine Sanctuary including the Monitor's anchor, propeller, steam engine, cannon and more than 125 other artifacts currently undergoing treatment. USS Monitor is a National Historic Landmark.